Need To Balance Your Ecosystem Pond? Home > Blog > Pond Tips & Tricks > Need To Balance Your Ecosystem Pond? Maintaining balance or equilibrium within an ecosystem pond is essential; otherwise it will succumb to the effects of entropy, or increasing disorder and decline. Given the high cost involved with installing these ponds, this is clearly not in your best interest. 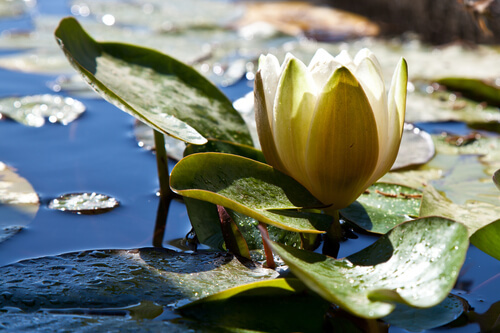 Here are some ways you can keep your pond beautiful and vibrant for many years to come. Algae are a greenish bloom which results from too much sunlight. When left unchecked the pond water will become green and swampy, declining in quality and harming any fish within. To get rid of it, you will want to purchase algae removers which will act rapidly to break down the debris upon contact. The best brands are those which are not sensitive to temperature and can be used even during winter. Plants are direct competitors of algae when it comes to acquiring sunlight and nutrients. As such they are a crucial and necessary component to maintaining pond balance. They provide beauty and diversity while also preventing the growth of algae. Some of the best plants for this purpose include species such as water lettuce or hyacinth. Marginal or bog plants like iris or cattails have also been found to be effective. They consume lots of nutrients and are known for their durability. All ponds are susceptible to the development of sludge over time. This sludge results from the breakdown of organic materials as well as fish food which is uneaten (a good reason not to overfeed your fish). Buying products which are rich in enzymes and bacteria will help to get rid of this sludge, as well as unneeded nutrients and fish wastes which reduce water quality. The best products are specially blended to give you the best results. At some point you’ll likely discover a leak in your pond. If you try to repair the leak using tap water this can be problematic as tap water tends to contain excessive nutrients which can promote algae growth within a pond. Upon detecting a leak you need to find the source and correct it as soon as possible. Run off must also be monitored. Many homeowners make the mistake of using insecticides or fertilizer near their ponds which result in undesirable run offs which cause algae blooms, and will also threaten the lives of the fish within the ponds. Overall, it is essential to keep your pond debris free as much as possible. Never allow leaves to fill up in it and make sure your skimmer is also cleaned, as decaying debris within it can cause undesirable nutrients. Above all, maintaining optimal pond quality requires patience. It will take some time for beneficial bacteria to take effect and colonize in a manner which is beneficial and visible. In most cases it can take a new pond from 2 to 6 weeks before the bacterial reaches a point where it can begin benefiting the pond.